The new Empress of the French took care of petitions, planned dinners and became a patron of the arts. She often awoke together with her husband before going about her toilette. She was given an allowance of 600,000 francs to maintain her household. Her days hardly ever varied; after her toilette merchants would crowd into her apartments alongside artists and after they had left, she did her correspondence. She received visitors in the afternoon and would then go for a short walk or would strum on her harp. She dressed for dinner with Napoleon and would then retire to her salon to spend the evening with courtiers. She went to bed around midnight. She had become Napoleon’s pet and her every move was reported to him. The Bonapartes hated her, but they did not realise that if he divorced her and married another woman, he might father an heir that would displace them. By 1806, his brother Joseph was King of Naples and Sicily, his sister Caroline and her husband Joachim Murat were Grand Duke and Duchess of Berg, his sister Elisa was Grand Duchess of Tuscany and his brother Louis and Joséphine’s daughter Hortense were King and Queen of Holland. Soon Napoleon was at the height of his power, and he had just one thing on his mind – a son of his own – and he knew Joséphine would not be able to give him one. Joséphine wrote to her son, “If they should succeed in separating me from him, it is not the loss of rank I should regret, sooner or later he would discover that those who surround him are more interested in themselves than in him and he would know how he has been deceived.” At the end of 1809, her fears were confirmed. He told her, “Joséphine! My dear Joséphine! You know how I have loved you! … To you, to you alone, I owe the only moments of happiness I have tasted in this world. But, Joséphine, my destiny is not to be controlled by my will. My dearest affections must yield to the interests of France.” Joséphine broke down in tears and had to be helped to her rooms. The new Empress of the French was to be Marie Louise of Austria who was horrified at the thought. Joséphine was told to leave for Navarre before the arrival of Marie Louise, and she obeyed, though she only left at the very last moment. She found a castle in ruins and begged Napoleon for money for repairs and furnishings. While there she received an offer of marriage from Prince Frederick Louis of Mecklenburg-Strelitz but she turned him down as she did not wish to start over in a new country. Joséphine could only sit and wait as Napoleon married Marie Louise in Paris. By July, Marie Louise was pregnant, and Napoleon was thrilled. Joséphine was at last allowed to return to her beloved Malmaison, and she gratefully wrote to him, “I feared I had been entirely banished from Your Majesty’s memory, I see that I am not. 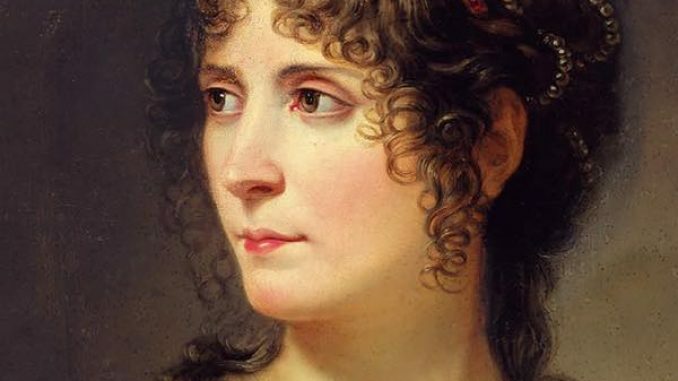 I am therefore less wretched today and even as happy as it possible henceforth for me to be.” However, Napoleon would not allow her to befriend Marie Louise and wrote to her, “No, she thinks you are very old. If she sees you and your charms she would be worried, she would ask me to send you away, and I would have to do it.” Joséphine and Hortense – now the former Queen of Holland as her husband had abdicated in 1810 – left to take the waters at Aix. On 20 March 1811, Marie Louise gave birth to a son, also named Napoleon. Joséphine sent a courier with a message of congratulations. She later said, “I am well pleased to find that the painful sacrifice I made to France has proved of some advantage.” Napoleon wrote to her, “My son is fat and healthy. I trust he will continue to improve. He has my chest, my mouth and my eyes. I hope he will fulfil his destiny.” A little while later, Joséphine was allowed to hold the baby in a secret meeting. Marie Louise found out and was furious. His letter plunged Joséphine into despair. At the beginning of May, she caught a cold while out walking with the Tsar of Russia. Hortense later wrote, “She seemed to me to have a mere cold, and her health was usually so good that I was not at all concerned.” Joséphine refused to let a cold hold her back and hosted a dinner and a ball for the Russian Grand Dukes and the Tsar. At the end of the evening of the ball, her fever was raging, and she felt very unwell. Hortense was with her and used mustard plasters on her. The Tsar even sent his own doctor. By the 28th of May, Joséphine was struggling to breathe, and she was unable to speak. She worried about infecting her family and tried to send Hortense away. The following morning, she was dressed in a pink satin morning gown, and Hortense and Eugène came to say goodbye. Hortense later recalled, “When she saw us, she held out her arms with great emotion and uttered something we could not understand.” Joséphine received the last rites at 11 a.m., and she died at noon. She was still only 50 years old but had lived many lifetimes.